Michael Wolff | “Wolff & Clark Expediton” Debuts Dizzy’s Club Coca Cola! Sign-up to receive site updates, latest tour dates, breaking news, free downloads and more. 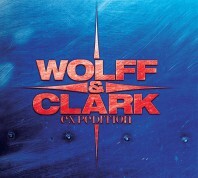 “Wolff & Clark Expediton” Debuts Dizzy’s Club Coca Cola! Join the Wolff & Clark Expedition at Jazz at Lincoln Center’s swanky Dizzy’s Club Coca-Cola for a night of bluesy, grooving music and good times as we celebrate the release of their debut album, “Wolff & Clark Expedition” on Random Act Records. On Thursday, February 28th, 2013, two sets at 7:30 and 9:30pm, we will be featuring an amazing band with fresh arrangements and compositions, you’ll be sure to be moving your feet by the end of the night. We recommend you make reservations and bring your friends! as well as other originals by Michael Wolff, Mike Clark, and Chip Jackson! The cover is $25/$10 for those with student ID, and CDs will be available for purchase as well as autographing at the show. The sooner the better! Tickets are already selling fast, so get them while you can!